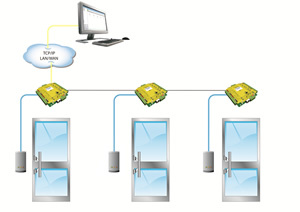 Access Control System / KTW Inc.
Net2 allows the end-user to fully manage and control all doors from a single PC. Users in Japan, England, France, Germany, Holland, Sweden, Spain, Denmark, America, and other countries around the world all enjoy its ease of use and reliability. Paxton Access of England is a specialist that dedicates all of their resources to the development of the world's best access control systems. From the very beginnings of research and development to production and sales, Paxton has achieved incredible growth and has held the #1 position in the British access controls market since 2006. Net2 answers all of the various demands of the office security market. For example, the system can easily be configured with a couple of clicks to allow all employees access to the main entrance, but only specified employees access to the server room. Other than access right for different users, you can also manage access rights based on time schedules to match operating business hours or use requirements for different parts of your office or factory. Net2 Professional offers even more features such as evacuation confirmation, integration with fire alarm systems, anti-passback, and more. Between to two systems, it is possible to create a system that perfectly matches your security needs. Net2's interface will be very familiar to anyone who has ever used Windows and works with an Explorer type interface. 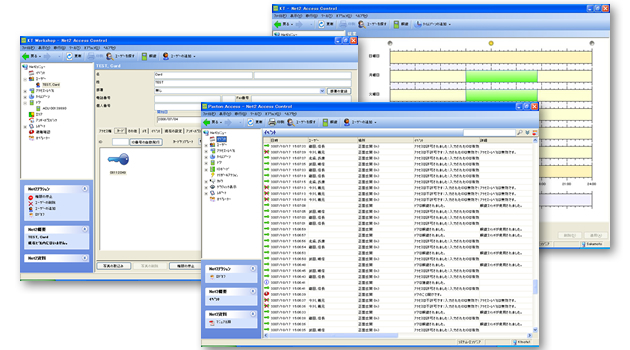 Through the graphical user interface, it is possible for anyone who knows how to use a computer to use Net2. 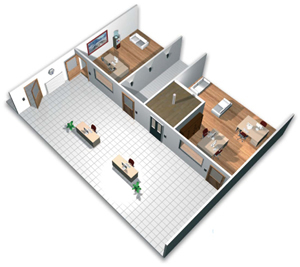 By creating a layout of the building, it is possible to visually locate access events such as normal room entry/exit, forced doors, propped doors, etc. Registering and editing users, inputting employee identification photos, setting user access rights, viewing records and logs, etc. can all easily be done from the same computer that you are used to using. Net2 works for any size job from just one door all the way up to 500. It is possible to add doors at your own pace whenever you need to in order to meet your security needs and budget concerns. Net2 is not only extremely functional, but also offers great cost performance. Use LAN within the same building and/or internet for remote access and control to the system. The system can be set up any way you need it to be in order to accomplish your goals. Start out by installing the system on some doors in your head office, then install it in your factories, then finish out the installation by installing the system at your branch offices and managing everything from headquarters. Install where you want, when you want, as much as you want, and in the order you want. With the flexibility and scalability of Net2, it is easy to create a system that perfectly matches your needs. 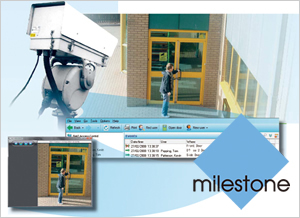 Create a perfect system by integrating Net2 with Milestone's XProtect™. It is difficult to stop things such as piggybacking or card-swapping with only an access control system. By matching access data with video, it is possible to monitor these kinds of activities and more. Just double-click on the camera icon in Net2 to see the video footage from the times of access or monitor everything in real time. Link Net2 with XProtect™ to see exactly who is doing what and where to protect your business, your employees, and your assets and to raise your security to the next level.